• 1x Eclipse DIY piping kit: 7 pieces total for turbo and intercooler setup. Light weight aluminum design. AdjustmentS are needed depending on engine layout and different setups. • 1x Turbo Intercooler: 28'' Overall Length x 7'' Height x 2.5'' Inlet/Outlet, tube and fin design. • 1x JDM sport T3/T4 Vband turbo w/ random filter: brand new turbo charger w/ internal wastegate. • 1x Black cast iron turbo manifold: Higher Resistance to Heat, Made to fit the 420A Engines, Bolt on Manifold. • 1x JDM Type-RS style Blow off valve w/ bov adapter: Quick response with high capacity Up To 500HP or 20 PSI of Boost Pressure. Professional Installation is Suggested. Aggressive blow off sound comes with bolt flange and hardware. Adapter piping can be bolted on or welded on for easy installation. • 1x Turbo Boost Controller: in order avoid replacing wastegate springs, which only gives a fixed increase, which is not adjustable, a boost controller will be the most cost effective solution. Allows adjustable boost psi settings, light weight design to be mounted under the hood. Hardware is included. • 1x JDM Sport Oil Feed Line: designed to limit the oil flow, preventing a blown turbo oil seal. 36 inch long with 3/8 diameter stainless steel line, hardware and gasket is included w/ 1/8 inch fittings for the engine. 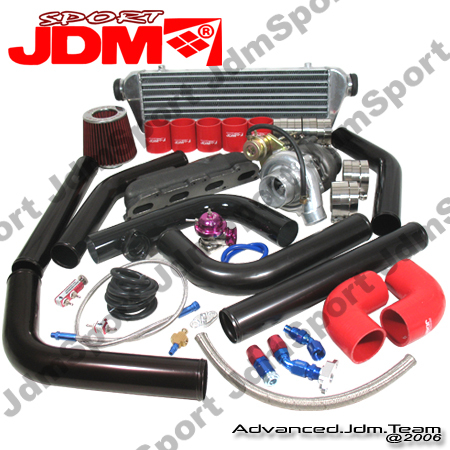 • 1x JDM Sport Oil Return Line Kits: Double layered and flexible oil tubing,durable and strong. • 7x silicon sealing couplers & 14x T-bolt clamps: 2.5 inch diameter couplers (color may vary) with flexible steel T-bolt clamps for better and stronger clamping to prevent leaking. Required Wastegate Block off Plate ( not included in the package ). Installation Difficulty: Professional installation is highly recommended.